When you see her, Leslie may be wearing a silk dress and fishnets or wearing Xtra-Tuff boots and carrying fishing nets, depending on whether she’s at her fishcamp in the Alaska wilderness or on a speaking tour “Outside.” She’s happy in both places talking about the books, places and topics that move her most. 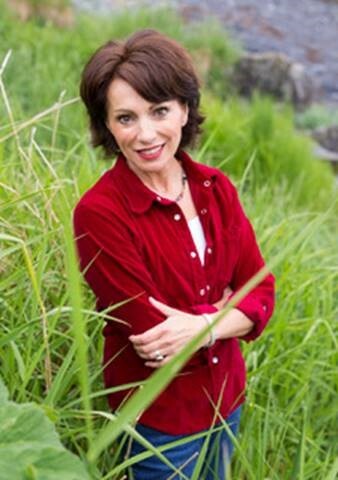 Her book list includes Crossing the Waters: Following Jesus through the Storms, the Fish, the Doubt and the Seas, which won Christianity Today’s 2017 Book of the Year in Christian Living; The Spirit of Food: 34 Writers on Feasting and Fasting Toward God, Surviving the Island of Grace: A Life on the Wild Edge of America, and Parenting is Your Highest Calling . . . and Eight Other Myths That Trap Us in Worry and Guilt, and many others. Her newest book,Forgiving our Fathers and Mothers, was published in early 2014. Her essays, appearing in The Atlantic Monthly, Christianity Today, Beliefnet, Books and Culture, Orion, etc. take on an uncommon diversity of interests: garbage, a theology of the body, culture-making, motherhood, narrative theology and points between and beyond. Her essays have won Pushcart nominations, the William Wilberforce Award and the Virginia Faulkner Award. “As much as I love words on the page, I’m not fully satisfied until I get to speak them in person with others,” Leslie adds. She says she’s honored to travel and share from her passions nationally and internationally at conferences, universities, churches and retreats. With three master’s degrees, she has taught collegiate classes for many years, including six years in Seattle Pacific University’s MFA program. If she can’t see her audience, radio is a good second. She has appeared on more than 150 radio shows including Family Life Today, Prime Time America, Focus on the Family, Chris Fabry Live! Leslie lives on Kodiak Island, Alaska with her family and her yorkie Sophie who thinks she’s a sled dog.